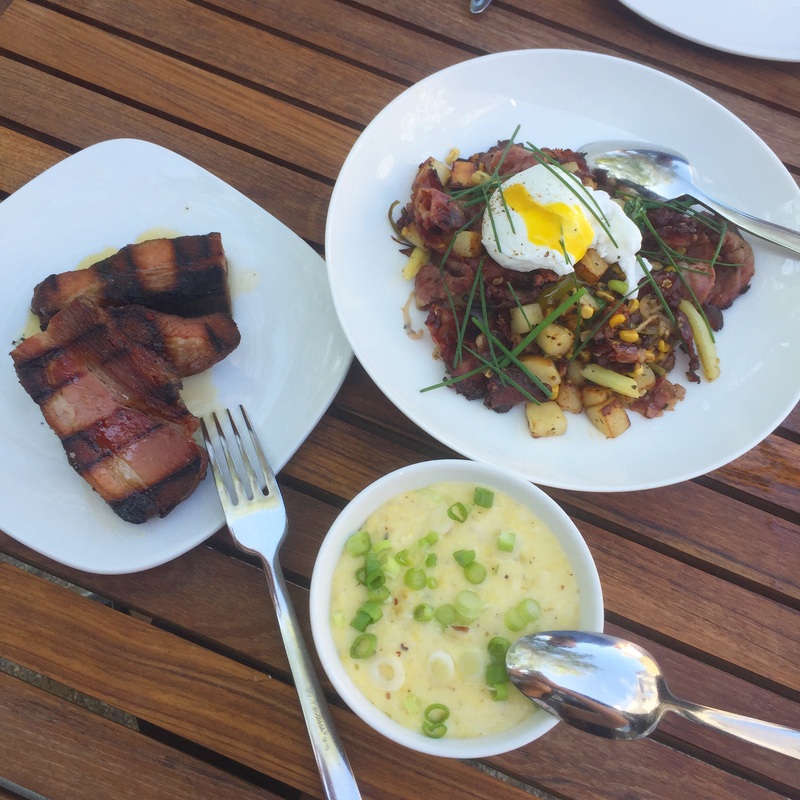 Obsessed and Addicted: Selden Standard – Eat. Rest. Repeat. This restaurant hits it out of the park on so many levels. I love this restaurant so much that I am dedicating a whole entry to it. This restaurant is exactly what Detroit has been yearning; somewhere hip and trendy that doesn’t have a cliche menu, is well executed, and has great drinks. Selden Standard nails it. I tell everyone about this restaurant, and if you haven’t heard me rave about this place, well here’s your chance. I’ve never had a bad dish there. Ok, maybe one time, but they agreed with my dissatisfaction and took it off my bill. We’ll get to that later. The flavors are so well developed, the accompaniments are thoughtful, and the taste profiles are exquisite. I really have to hand it to them…I never thought I would find such a perfect restaurant in the heart of Detroit. I never thought I would fall so in love with a place so unique and diverse….if this restaurant were a man, it would be the epitome of a knight in shining armor…MY knight in shining armor…..my heart, my soul…my everything. The dishes here are kind of like tapas…I wouldn’t necessarily say it is a tapas restaurant, but the plates are small and I believe you are supposed to order multiple dishes. This restaurant is farm to table; they buy fresh ingredients from local farms and vendors, and because of this, their menu changes more frequently than not. They keep their all star dishes for the most part, but don’t be surprised if your favorite dish is all of a sudden off the menu. Now, I’m not going to be going into too much detail about every dish because I’m obviously going to say that everything is DELICIOUS, but I’ll try to write as much as I can. 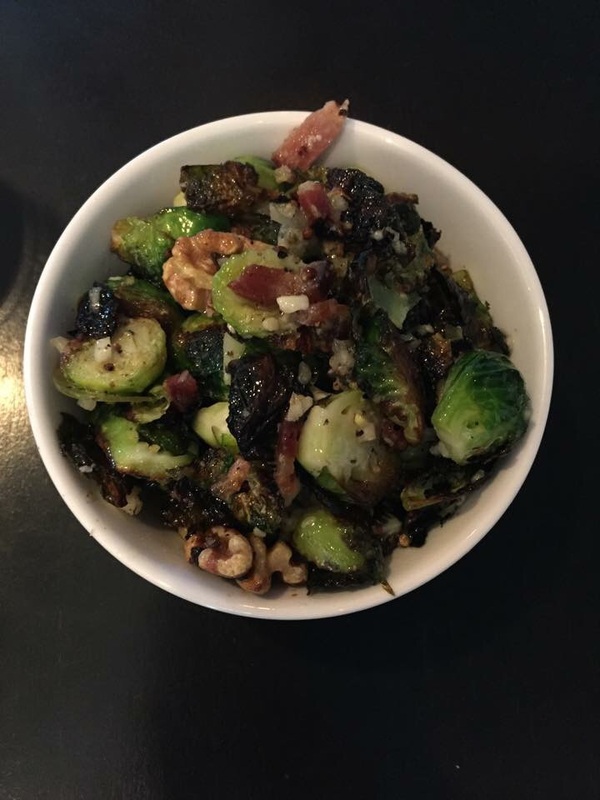 Brussels Sprouts: very well done. This is one of those trends that has been going around; everyone is trying to make Brussels sprouts. I don’t believe this is on the menu currently, but if you ever see it on there, it’s a great side dish! 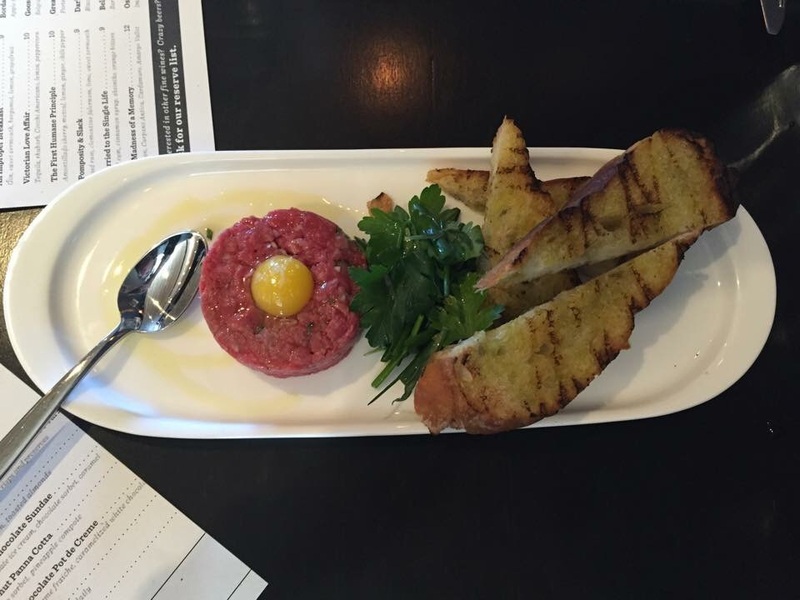 Beef Tartare: Perfect 10. I mean, how do you describe perfection? The meat is sliced very well, with fresh meaty aromas; the egg yolk is always perfectly placed, and the flavors are spectacular. In my previous post I mentioned my habit of frequently ordering the same thing….so far, nothing will top this beef tartare. London Chophouse, Capital Grille, and Big Rock Reserve come rather close, but for me, this takes the cake. 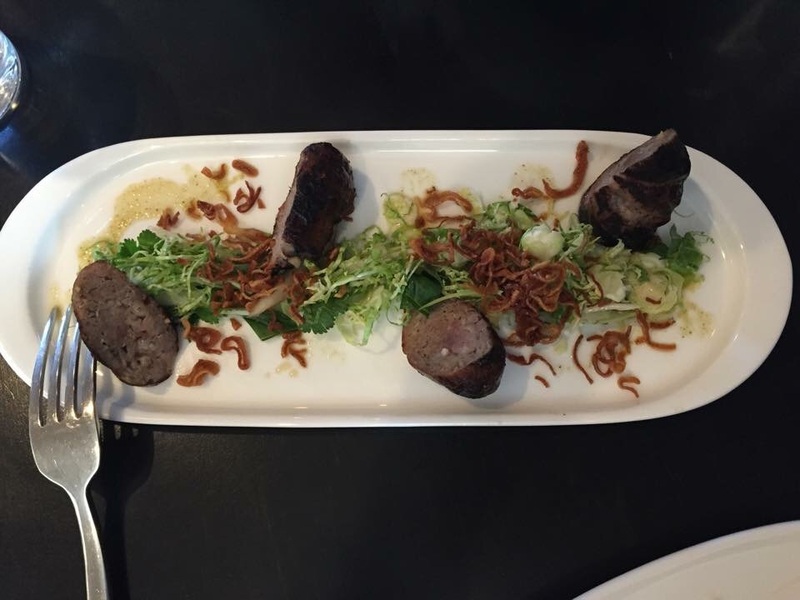 Duck Sausage: Delicious, duh. It has a very reminiscent Thai or Vietnamese flavor. Something about it tastes like home to me. You don’t get a whole lot in this plate, but what you do get is without a doubt, deliciousness. 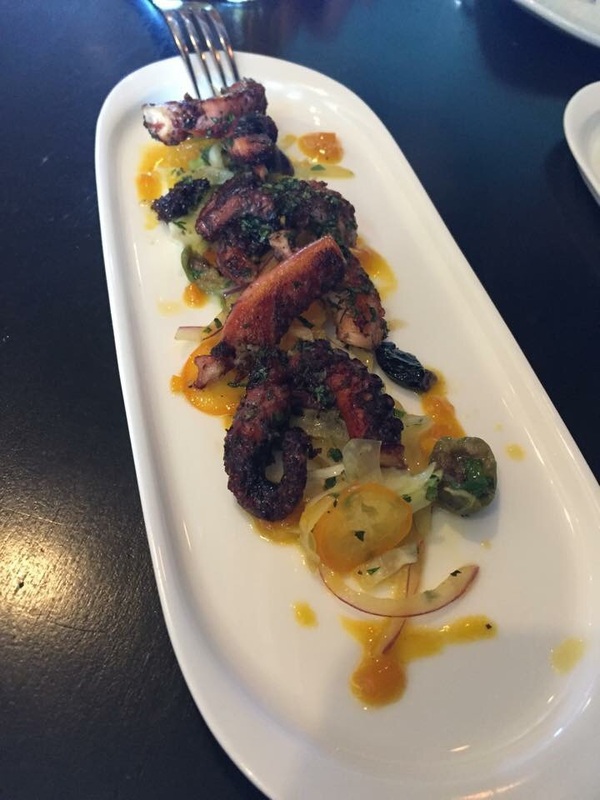 Grilled Octopus: Tender, succulent, great citrus. I could do without the olives, but everything on the plate can be, and should be, eaten together. You get a little bit of everything: sweet, tangy, savory, umami, citrus, etc. 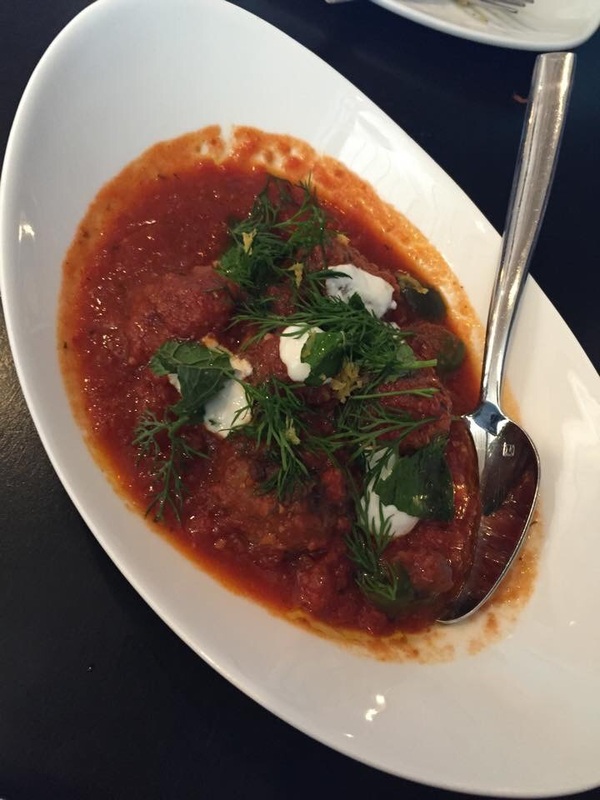 Meatballs: I believe these were lamb meatballs; I haven’t seen this on the menu in a while so I’m sorry to say that I have forgotten the description. The tomato gravy was done right, something that any Italian Nona would be proud to serve. The meatballs were big and meaty. Pretty good dish, but I’m not mad that it’s no longer on the menu. 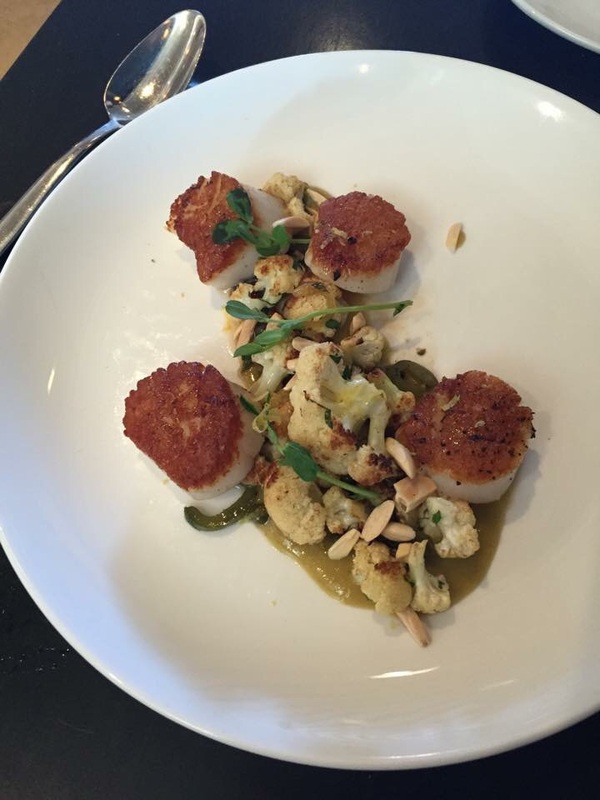 Scallops: I am such a sucker for scallops! I wish EVERY restaurant could make scallops like this. The sauce underneath, and the perfectly cooked cauliflower on top…I lick the plate clean every time. I don’t care how foolish I look with my plate to my nose, it is worth getting every last drop into my mouth. 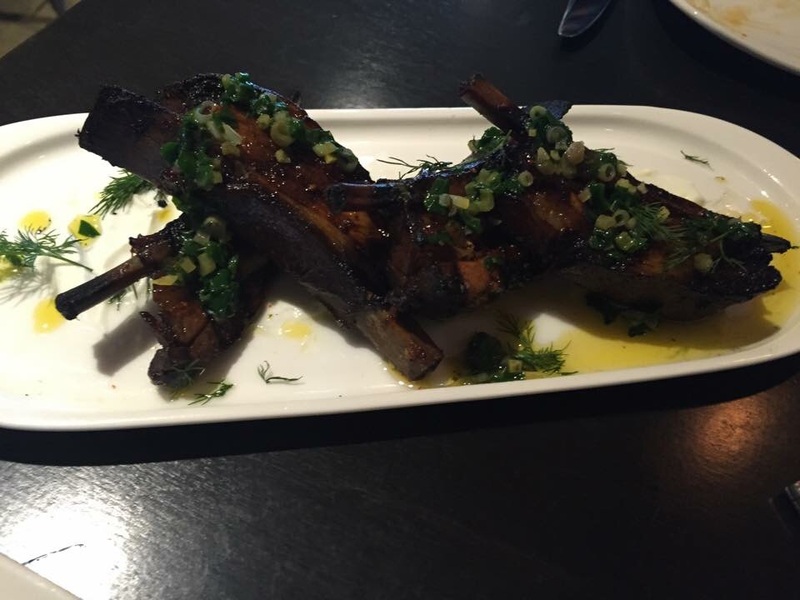 Lamb Ribs: This is different. I don’t know if I had ever seen lamb ribs offered anywhere else. The meat falls off the bone. The seasoning contrasts with any gaminess the meat exudes. The char is just right. Awesome dish. 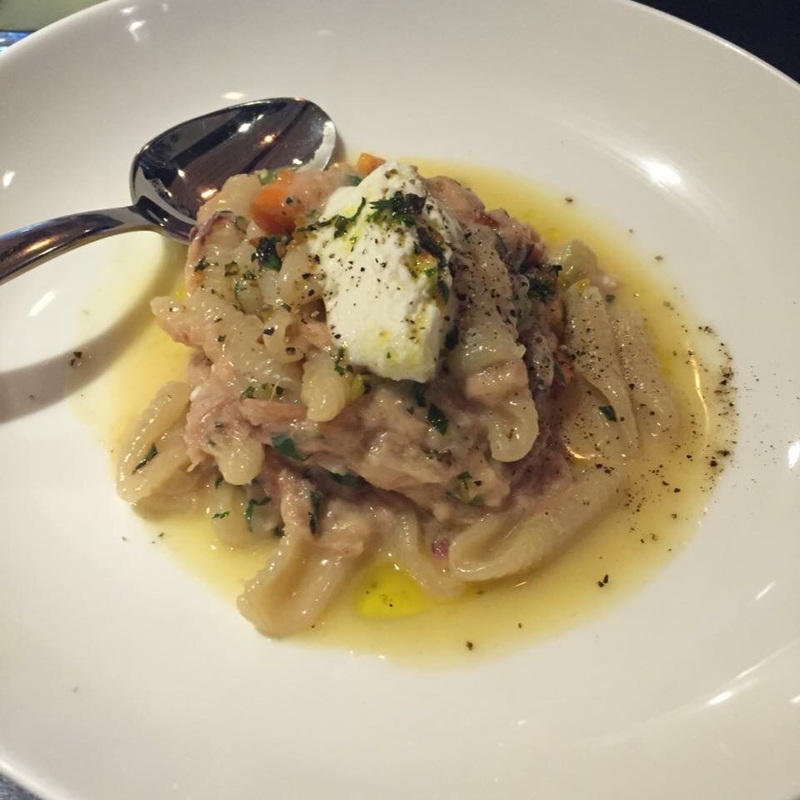 Rabbit Ragu: My mouth salivates just looking at this photo. I am not a big fan of rabbit, as it is typically dry and not impressive. This dish is the complete opposite. Honestly, you probably wouldn’t even know it was rabbit if no one told you. You can taste the love in this dish. The pasta has the perfect bite, it’s chewy and starchy without being hard or grainy. Perfection. The rabbit is stewed for so long that it is tender and melts in your mouth like butter. There is also this subtle hint of citrus in the dish that you don’t expect, but you welcome it because it works so well with the rest of the dish. Everything about this is phenomenal. I could eat this everyday. EVERY single freaking day. 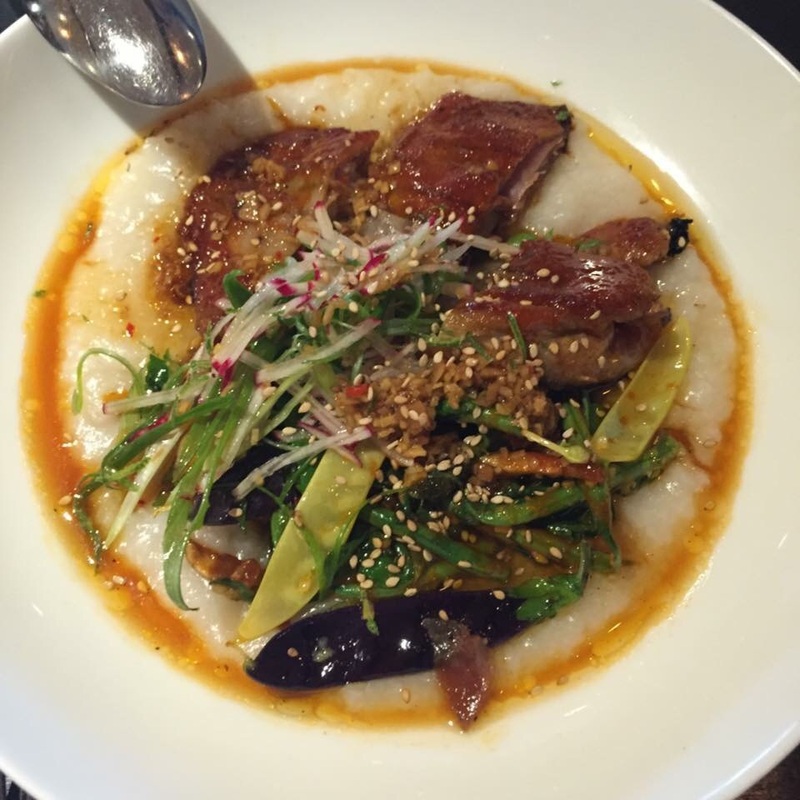 Duck Congee: THANK YOU SELDEN STANDARD FOR INTRODUCING THIS BELOVED ASIAN CLASSIC!!! NEVER have I EVER seen congee served in a non Asian establishment. This takes the classic rice porridge dish and spices it up with chilli oil, Korean BBQ Duck, and generous amount of complementary veggies. Wow. Unfortunately, you probably won’t find any congee like this in Asia, but this? This is a flavor explosion in your mouth. 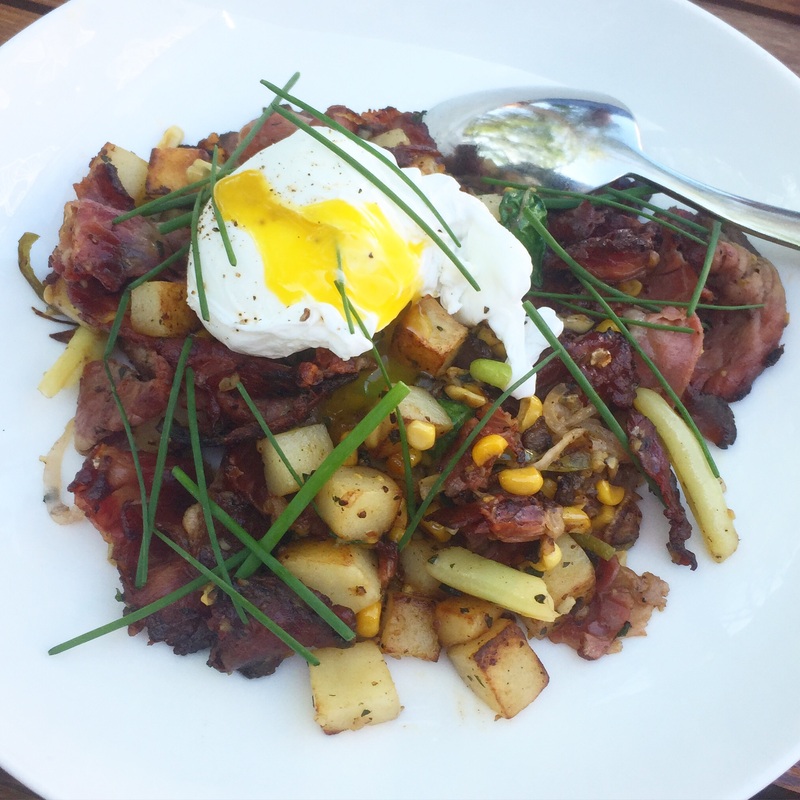 Pictured below is their Pastrami Hash. I was thoroughly surprised and delighted to have such a thoughtful brunch. The pastrami tasted like bacon, but better. The egg was perfectly poached, the corn and potatoes and veggies were perfectly seasoned and well balanced….. Everyday would be a great day if I could have this in my belly. This is happiness on a plate. Finally, a place that does grits right! The cheesy grits covered in scallions was a perfect side dish to my pastrami hash. I could eat that alone and be in a happy place for the rest of the day, but together, the combination is irresistible. Now for the only bad thing I’ve ever eaten there….the grilled pork belly on the left side of the picture. It was dry and salty and incredibly hard to slice, like a dried out piece of ham. Nothing about it was representative of pork belly. Our waitress noticed we didn’t eat the majority of it; upon speaking with the chefs, they agreed it was incorrectly cooked. I was pleased that they apologized for it, as I wasn’t sure if they had intended to cook it that way. I respect and admire them for catching and correcting their mistake. I cannot wait for more new items on their menu! My love for this restaurant is unconditional. You NEED to experience this restaurant for yourself to understand my obsession and addiction….and once you do, let me know what you think!